Pat and Bill van Camp of Big Catch on Niagara Street are calling it quits. 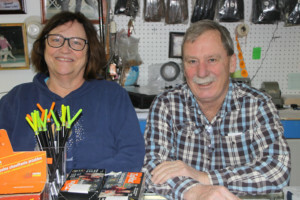 Back in 1976, Bill and Pat van Camp moved to the Riverside section of Buffalo and decided to open a bait and tackle shop – Big Catch on Niagara Street. They had $500 and bought as much tackle as they could to get the business up and functioning. They had both quit their jobs to put their hearts and souls into the fishing industry. After a few years of operating, they had noticed trucks coming in from Ohio and collecting bait at the foot of Ferry Street in Buffalo. That was when they expanded the business to include baitfish. After focusing on wholesale bait collection, they decided to take the bait on the road. They started to deliver to Pennsylvania, Ohio and Michigan, as well as all around New York. At one point, Big Catch supported five full-time bait collectors. They had a staff of 26 employees associated with the store, including drivers. Things went great for many years, at least until the arrival of VHS – Viral Hemorrhagic Septicemia. VHS hit the state in 2005, and by 2007, new fish transportation regulations were put in place and baitfish distribution came to a screaming halt. It took them two years, but they finally transitioned from wild-caught baitfish to certified baitfish that were trucked in from other states like Arkansas. In the meantime, the restrictions taught many of the local fishermen how to catch bait on their own as the cost of baitfish continued to rise. That increase in cost will continue now that the Big Catch family has decided to retire from the business, leaving a huge void in baitfish availability. Since the announcement of the store closure, baitfish costs to the small stores have already gone up again, according to the van Camps. With only a few bait wholesalers left, it appears that they will not be able to service all the 150-plus tackle shops that Big Catch supplied. The smaller shops in out-of-the-way places will suffer. When you factor in other difficulties like the increase in competition from online and big box outdoor stores, as well as localized issues like the high-water levels on Lake Ontario, many of the Mom and Pop operations are struggling just to keep their doors open. Yes, it’s important to get the next generation involved with fishing. And it’s important to support your local bait and tackle shops. Let’s hope that the closure of Big Catch in Buffalo doesn’t cause a snowball effect and force the closure of other shops around the state. We wish the van Camps well. Bill can now go fishing and Pat can spend more time with their dog, Gucci, a beautiful Weimaraner. They have a house in Allegany County they will be able to spend more time at, as well as a place in Buffalo. Their son, Aaron, who has a cans-for-cash business next to the old shop that is closing, will still sell worms and crabs. However, the baitfish end of things is now history.